I have bought quilts from Zone Kid in the past and I'm always pleased with the quality and design. This was no exception. The quilt washes up great with just a light ironing needed. Totally Transit is perfect for young boys. 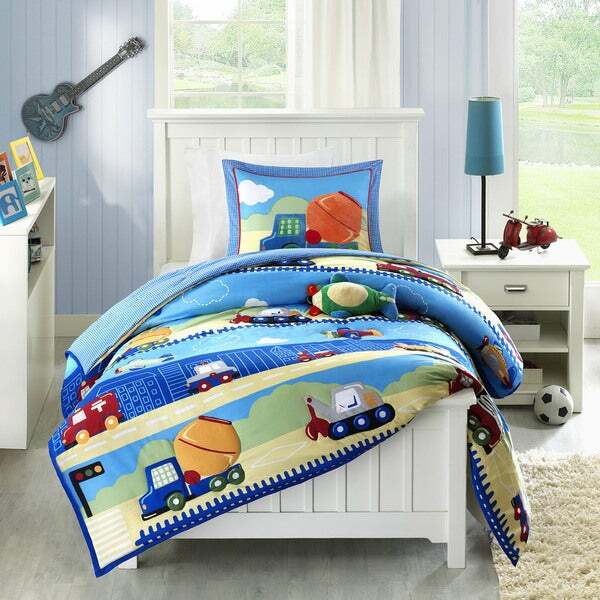 Colorful toy trucks, ambulances, motorcycles, airplanes, and helicopters run across this fun comforter. Several trucks are outlined and quilted creating added dimension to this collection. A blue and white gingham print covers the reverse matching back to the top of bed perfectly. This comforter set includes one sham with an applique plush design in the center along with a plush decorative pillow. we purchased this in a full-size version for our twin toddlers, and they LOVE it. i admit that we have purchased a lot of bedding because one has allergies/asthma and we are constantly changing and washing everything in the house. however, given all of that, this isn't your spectacular pottery barn quilt or anything of that sort, but it is a bright and happy set of bedding that my boys absolutely LOVED! they were so excited. it has been a long time since we have used anything other than either a duvet or a quilt, so this traditional comforter was new for us, but it is very soft and snuggly, so on top of the bright happiness, and the boys' love of it, it is nice to snuggle under too. i would definitely buy this in a bunch of different kids' styles if they offered more, because they are fabulous for the price - great cute factor, happy kids (almost as happy as paw patrol sheets - which are the bomb at our house, anyway), snuggly and very easy to wash and dry. This queen comforter set was a huge hit with my 4 year old. He loves the colors and action-oriented vehicles. The two pillow shams are great though they depict the same cement mixer image. The biggest delighter for my son was the stuffed plane that came with the set. FYI - the comforter is a little light / thin but with a cotton blanket between the comforter and the sheet, my son sleeps comfortably. The comforter is beautiful! the pillows have truck appliques. My son loved this comforter! The colors are bright and cheerful. My 3 year old grandson loves the pattern, and he wants to sleep with the pillow sham and the stuffed airplane every night even though there is almost no room in the twin bed left for him! My grandson LOVES this bedding. The colors are vibrant, the material is soft and not too bulky, it's just what we wanted! The soft, plush air plane is an added bonus. I ordered some sheets that have cars and trucks on them and it matches beautifully. I could not be more pleased! Great bedding for that special boy! My grandson loves trucks and construction vehicles, so when I saw this comforter set I had to have it! It is very high quality. I washed it prior to putting it on his bed and it came out like new. The colors are vibrant! Very good buy. My son loves this set. I bought it two years ago, and it has held up well. Washes well and colors stay true. It is soft, unlike some of those cheaper character sets. My son LOVES his blanket. Helped us with transitioning him out of our bed into his. Keeps him warm, yet it's not overwhelmingly heavy. Bought this blanket a few years ago when my kids were just babies, and haven’t changed it since. It’s durable, the color stays, and the kids love the design. It looks as good as the first day we got it. My son also loves the decorative pillow that comes with it. sooo cute. high quality and not cheap like most kids bedding. my son will love this! bright colors and well made. a++++++++++++++++ one happy momma!! I searched for a long time for the perfect vehicle bedding for my son, and this is it! The colors are so bright and cheerful! We love the variety of construction and emergency vehicles. It washes well and we get lots of compliments on it. Comforter very bright and very comfy. Perfect for my son’s room. Also love the shams and the micro suede accent on them. "Does the comforter have trains on it?" Hello Fufer13, this awesome set features a wide variety of items from trucks, ambulances, motorcycles, airplanes, and helicopters. This item features a train in the photo, however we cannot guarantee each set features a train. We do apologize for the inconvenience. Thank you for shopping with us. Because my son needs durable well made bedding. He likes the appearance. My son loves anything with wheels and the reviews were really good. My grandson loves cars and trucks and his birthday is just around the corner when he will turn 3. In anticipation of him moving into a big boy bed, I am hoping this will make that day even more special. "Do you have any curtains to match this set?" Hello jaceva, I'm sorry I couldn't find that we have any other matching pieces to this set. Have a great day! "Wondering how many shams come with the queen comforter set? The description states 4 piece - what are the four pieces? Thanks"
Hello eac81, the pieces include the comforter, two shams, and a decorative pillow.Thanks for shopping with us! "Is it possible to purchase an additional pillow sham for this comforter set?" Thank you for contacting us damaravictoria. Unfortunately no, we apologize for any inconvenience we might have caused. Please let us know if you have any further questions.